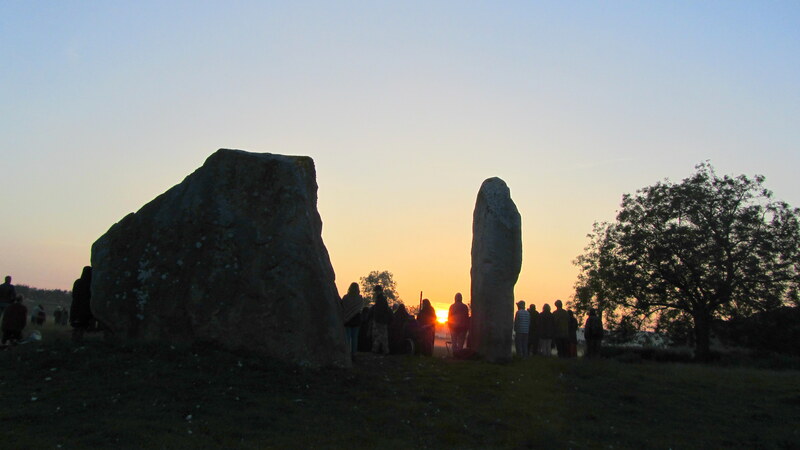 The above picture shows the sun rising on the Summer Solstice at Avebury in 2014. For hundreds of years people have puzzled over possible astronomical uses of Neolithic sites like Avebury and Stonehenge and this has been the subject of endless debate and speculation. Archaeologists are constantly working with immense dedication to increase our understanding of such ancient sites in the British Isles but, unlike in ancient Egypt or Babylon, no vast wealth of written language has been found here to explain the intentions of their creators; pottery and artefacts show us only patterns and so speculation can run wild. Clearly the desire to believe in the sacred, cosmic or even magical significance of such places needs to be balanced by a healthy scepticism in an attempt to avoid beliefs about our ancestors which have no basis in fact. On the other hand, if we want to understand our ancient history in the absence of writing, then we have no choice but to find other things to attempt to read. To an artist, a musician or a mathematician patterns can sometimes speak volumes. They can just as easily of course be mere doodles or decoration but if there is reason to think they could be more than this it becomes important to try to find out how to read them. Forgotten ancient languages were deciphered by pattern recognition where comparison to a known language was possible, as in the famous case of the Rosetta Stone whose three parallel texts facilitated the breakthrough in deciphering ancient Egyptian hieroglyphics. The association of unknown pattern with known meaning gradually became the translation of a language whose previous last known use was in about 400AD in the temple of Philae, and which was then lost until the 1820s when it began to be deciphered by Champollion. I have heard it said by some that the tendency of the human mind to recognise patterns in things leads to wishful thinking, and of course it easily can if the apparent patterns turn out to be a mere coincidence or accident of nature. It is also true that the imaginitive flights of fancy of an artist or a poet can lead to nonsensical beliefs, and that a visionary thinker may appear to be insane (or in some cases may in fact be insane). On the other hand, what explorer does not wish to find something? If you cannot first imagine something then nor can you create it. Not only that but if someone else has already created it and you have insufficient imagination you might have trouble recognising it. Indeed if you cannot imagine the possibility of something existing then you are almost guaranteed never to find it, to be too blind to see it even when it is right in front of you, or maybe even to be destined to cast it aside even as you seek it everywhere, like the philosopher’s stone, because you think it should take a different form! Truth is so much more fascinating, beautiful and strange than fiction and there is a world of difference between uncritically swallowing every half-baked theory out there that might seem vaguely ‘cool’ (or cynically using any which might potentially generate a fast buck) and using imagination and reason to find the truth. Perhaps we are so in the habit of romanticising about our ‘lost knowledge’ that it seems somehow ‘wrong’ to actually rediscover it. We may also be in the habit of imagining that any such lost knowledge would somehow have been cut off from the rest of the world’s ancient history. In fact, as I will be able to demonstrate from the dates and events that I have been able to find with it, Avebury’s Geometry turns out to be a calendar that other civilisations preserved, and a foundation into which later mythology and religions were subsequently fitted. The archaeological remains at Stonehenge and Avebury became a World Heritage Site in 1986 but in the ancient world, physically impressive as these henges and stone circles must have been, it would have been their geometry that was the true wonder. I feel fortunate that I have been able to see how it is actually in the geometry of Avebury Henge that our great national treasure lies and so I do not apologise for making some claims for it here that will prompt many to ask whether this is a delusion. I am confident that those who read my book carefully will see that it is in fact a coherent theory I am presenting, not a mere wild imagining. When the Summer Solstice sun is watched from the cove stones rising at Avebury as seen at the top of this page there is currently no stone in the outer circle to mark the azimuth of its rising. This is because a gradual destruction of the stones at Avebury began in the middle ages and only stopped when Alexander Keiller bought the land in the 1930s. Enough information nevertheless exists on their original positions for me to have been able to do a thorough analysis of its geometry. The book I am writing and drawing to explain it will be called The Avebury Mechanism.